We are one of the leading auto collision repair shops serving customers in Woodbridge, VA. All repair & custom services are performed by highly qualified technicians. If you want a quality repair on your vehicle with a brand new finish touch, with a more personal and friendly atmosphere, you have found it. We have all the latest specialist tools and equipment that is specifically tailored for the proper repair of your vehicle. 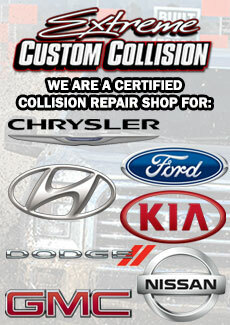 Our auto collision repair shop is capable of servicing a variety of vehicles. We only do the work that is needed to fix your problem. Here at Extreme Custom Collision our commitment to our customers is total satisfaction, our attention to detail is the backbone of our business! We are dedicated to making sure every customer’s vehicle is repaired to factory specs. All our technician skills are up to date with industry standards, we go the extra mile for every customer no matter how big or small the repair is. When a vehicle leaves this repair facility it is checked not by one quality control personnel but by everyone. The owner checks every vehicle over, then the general manager, and so on right down to detail shop! A shops reputation is based on several things quality, repair time, and overall satisfaction our goal is to make sure that every customer is totally satisfied in every way, if for some reason a customer is not we will make it right no exceptions … Having great customer service makes us very proud to do business, it’s not just about fixing cars its about exceeding a customers expectations, earning customers trust and confidence, and providing a pleasant experience for all of our customers. To consistently provide solutions for our customers through exceptional, personalized experiences with outstanding levels of employee engagement and commitment. Do I have a choice of selecting a collision repair shop? Yes, as a customer you have the right to choose what repair facility is going to repair your vehicle! It is not mandatory that the vehicle should go to one of the insurance companies preferred shops, yes insurance companies have what is called DRP centers which is a Direct Repair Program when the shop works directly with the insurance company on the repairs to your vehicle but that does not mean your vehicle has to be repaired at that facility. Why do business with Extreme Custom Collision?